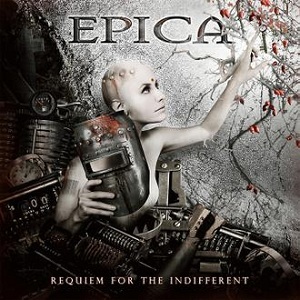 Requiem for the indifferent is the fifth album from Dutch band Epica. According to the band, the title refers to the end of an era. Mankind can no longer stick their head in the sand for the things that are happening around us. We are facing many challenges. There is an enormous tension between different religions and cultures, wars, natural disasters and a huge financial crisis, which is getting out of control. More than ever we will need each other to overcome these problems. As we are all connected; the universe, earth, nature, animals and human beings, this period in time will be the prelude to the end for those who still don't want to, or simply won't see it. A REQUIEM FOR THE INDIFFERENT but also a possibility for a new beginning with great new chances! If you've got the last Epica album (Design your universe) then you'll have a good idea of what to expect - there's been no sudden change of direction. Instead what you get is more of the same - listening to the songs most of them would fit neatly into Design your universe. That isnt a criticism, just a description - after all, when you find a winning formula there's no point changing it just for the sake of change. There's still plenty of variation in the songs, and lots of the details change, but the basic structure remains the same - beauty and the beast vocals (beautiful clean vocals from Simone Simons plus growls and grunts from Mark Jansen), a rich orchestral sound that fuses classical music into heavy metal and a choir used. The songs vary from fairly simple to highly complex and technical, but are so well written that they all fit together perfectly. The album opens with "Karma". It has a very classical music feel to it with its drums and orchestra, with a choir joining in half way through the track, and the power and pace build nicely as the song reaches a climax, and goes straight into the first real song of the album "Monopoly on truth". "Monopoly on truth" is a seven minute epic which includes everything you expect from Epica - beautiful vocals, pounding drums, excellent guitar work, a rich sound, changes of pace and intensity - in short it's an excellent track. "Anima" is another short track - only around a minute and a half long. It's an instrumental - a piano piece with gentle background music from strings. It's a very slow delicate piece of music which serves to emphasise the power of the music in the other songs - it provides a nice contrast. With nine of the songs being over five minutes in duration, this is a nice long album. Epica really use the time to its fullest extent and make each song feel almost like a mini album with the amount of stuff they cram in, and this really does work well. Fans of Epica are definitely going to enjoy this album - it's easily up to the standard you expect from the band, and is an album you can enjoy listening to again and again. Epica have done here is evolution rather than revolution - no radical changes from the last album, instead they've just taken what worked well and made it even better. I've been listening to this album a lot since I got it to review, and will no doubt be listening to it even more over the coming weeks and months. Requiem for the indifferent will be released on 9th March in Europe, 13th March in North America, through Nuclear Blast.